If we’re ever going to make it in space exploration to distant planets like Jupiter let alone outside of our solar system, we’re going to need some serious spacesuits that provide an unlimited supply of oxygen, energy, food and water. To achieve that we’re going to need more than oxygen bottles and waste management, we’ll need suits that actually produce fuel for us and these creepy bacteria-filled, 3D-printed vests could be the ticket. Inside the intestinal-like suits are thousands of cavities where special bacteria and algae feed off sunlight or waste and produce critical elements we need to survive. Seems far-fetched, but actually could be doable and completely necessary for long-term space exploration. Existing spacesuits are quite limiting – look at the movie Gravity – there was only so much time before the oxygen ran out. To be able to hack it for serious space exploration, space suits need to do way more than just protect us from the lack of atmosphere. They also need to supply oxygen, food, fuel, water and manage waste. To do that you’ll need a mini factory of sorts in each suit that can provide an unlimited supply. One idea is to use bacteria and algae that feed off sunlight or waste and in return pump out sucrose, bio-fuels, clean water, light, and more depending on the particular species. 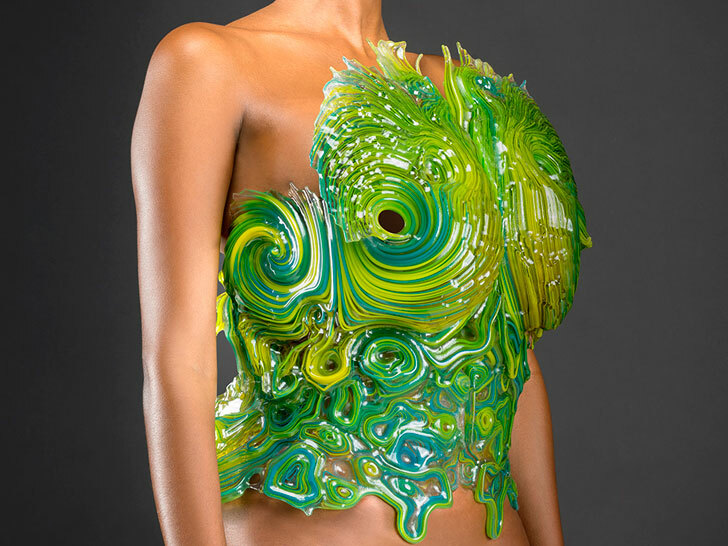 To accommodate these bio-engineered powerhouses, MIT professor Neri Oxman, collaborated with German designers Christoph Bader and Dominik Kolb have created these digestive-track inspired suits made by 3D printing. “Each wearable is designed for a specific extreme environment where it transforms elements that are found in the atmosphere to one of the classical elements supporting life: oxygen for breathing, photons for seeing, biomass for eating, biofuels for moving, and calcium for building,” Oxman explains. So far, the design team has just engineered the empty suits, printed with Stratasys multi-material 3D printing technology. Soon, they will begin tests to pump in engineered bacteria to see how they fare. We can’t be surprised to see engineers hacking living systems and incorporating them into wearable technology. In fact, this is likely to develop into a whole new subset of wearables that involve living materials to help us with energy, food, or even fashion. Could These "Wearable Biospheres" Help Us Survive on Alien Planets?